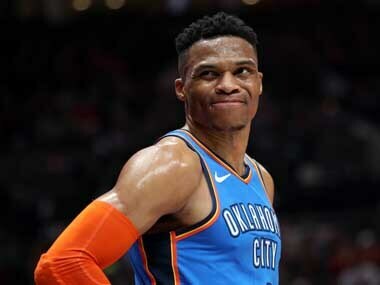 Los Angeles: Russell Westbrook, determined to bounce back from an embarrassing defeat, produced his 25th triple-double of the season on Friday to propel the Oklahoma City Thunder to a 114-102 NBA victory over the Memphis Grizzlies. Westbrook's 38 points included his team's final 15. He handed out 12 assists and pulled down 13 rebounds for the Thunder, who had been routed 128-100 by Chicago on Wednesday. After that debacle on their home floor, Westbrook said, it was imperative the Thunder seize the early initiative. "Especially after last game, when you lose and get out-played," he said. "Tonight we came out and were the more physical team, set the tone in that aspect. "We were physical, came out and hit first in a grind-it-out game." 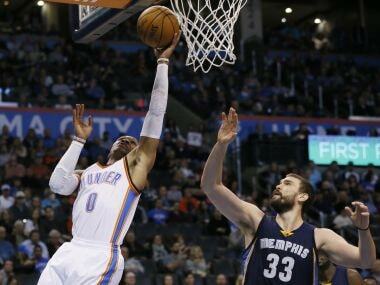 Center Steven Adams of New Zealand added 16 points for the Thunder. Joffrey Lauvergne came off the bench to contribute 16 as Oklahoma City snapped a three-game skid. Spanish big man Marc Gasol led the Grizzles with 31 points and eight assists. Mike Conley added 18 points but the Grizzlies saw their three-game winning streak end. "It's disappointing," Conley said. "This is a big game for us, not just because it's OKC, but the schedule, the standings. These games matter for us." Westbrook's 25 triple-doubles are the most in a season since Wilt Chamberlain had 31 in the 1967-68 campaign. But he wasn't the only player stuffing the stat sheet on Friday. Serbian center Nikola Jokic notched the first triple-double of his career to help the Denver Nuggets to a 121-117 victory over the Milwaukee Bucks. 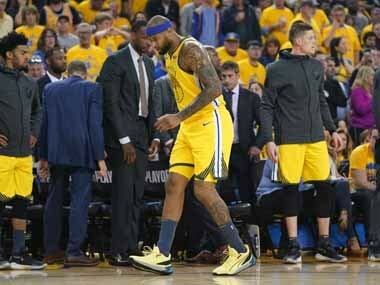 But Sacramento Kings forward DeMarcus Cousins's triple-double came in a losing cause. Jokic, back in the Nuggets lineup after missing three games with a left hip flexor strain, scored 20 points with 13 rebounds and 11 assists. Wilson Chandler added 21 points and eight rebounds for the Nuggets, who led by 22 early in the third quarter then withstood a Bucks comeback bid. Jabari Parker scored 27 points for the Bucks and Giannis Antetokounmpo added 23. Antetokounmpo's three-pointer pulled Milwaukee within 113-112 with 2:53 to play, and Parker again got the deficit to one point with a driving layup with 1:43 remaining, but they couldn't get in front. In Sacramento, Cousins scored 22 points with 12 rebounds and 12 assists for his second triple-double of the season. But it was Phoenix guard Devin Booker who stole the show, with a fadeaway basket as time expired that gave the Suns a 105-103 victory. Booker scored more than 30 points for the eighth time this season, and took his string of successive games with at least 20 to 15 straight as the Suns snapped a five-game skid. Isaiah Thomas scored 38 points to lead the Boston Celtics to a milestone win over the Los Angeles Lakers on Friday, a 113-107 triumph that earned Boston's Brad Stevens an All-Star coaching job. Thomas produced his usual fourth-quarter pyrotechnics, scoring 21 points in the final frame to help the Celtics stretch their NBA winning streak to six games. 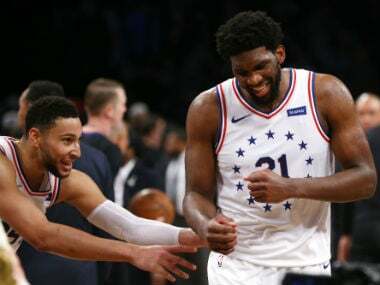 And they took the franchise's total of NBA regular-season victories to 3,253 -- taking the all-time lead in wins from their longtime rivals the Lakers. It was the first time since the 2000-01 season that Los Angeles hasn't at least been tied atop the list of all-time victories. Before the game, Celtics coach Brad Stevens called it "unbelievable" that the clubs who boast a long and storied rivalry came into the contest tied at 3,252 wins apiece. "I think it's a unique enough rivalry that 100 years from now it will probably be tied again," he said. But the current Lakers and Celtics players are far removed from the 12 championship series between the two clubs -- a rivalry that flowered first in the 1960s and again in the 1980s and the 2000s. The Lakers are still trying to find their way after plunging to a franchise worst 17-65 record last season. But Stevens said a game against the Lakers was always a challenge. "They've got a bright future ahead and I like their young talent," he said. "They're a scary team to play against." The win had an extra repercussion for Stevens. Less than an hour earlier, the Toronto Raptors fell 102-94 to the Orlando Magic. That means the Celtics are assured of second place in the Eastern Conference as of Sunday, so that Stevens will coach the East in the All-Star Game this month. The honor would go to Tyronn Lue, coach of East-leading Cleveland, but he coached in the midseason exhibition last year and therefore isn't eligible this time around. "Well, first of all, it should be Ty Lue, but the way the rules work then it's the next-best record because he did it last year," said Stevens, whose team is 32-18. "But what's nice about it is there's no politics in it. There's no subjectivity -- it's what your team has accomplished." Thomas, who leads the league in fourth-quarter scoring with more than 10 points per game in the final period, scored his 37th and 38th points with 2:25 left in the game but didn't take another shot. He just missed becoming the first Celtic to score 40 points in three straight games. "I didn't know about the three games in a row," he said. "I didn't know about it or I would have had the last shot." "I'm glad we won," he added. "That's all that matters." In Houston, the Rockets retired Yao Ming's jersey, then prevented the Chicago Bulls from putting a damper on the celebrations by holding on for a 121-117 overtime victory. James Harden scored 42 points, including the deciding free throws in the final 36 seconds of overtime against a Bulls team that was missing star Jimmy Butler because of a heel contusion. 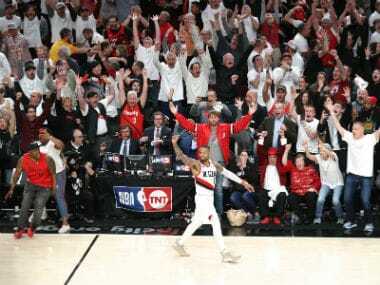 The tense finish came after an emotional halftime ceremony honoring China's Yao, whose selection in the 2002 NBA draft made him the first player drafted number one overall who hadn't played collegiately in the United States. Yao, forced into retirement in 2011 after a string of foot injuries, was the sixth Rockets player to have his jersey retired. Rookie guard Yogi Ferrell, plucked from the developmental league by Dallas last week and signed to a 10-day contract, scored 32 points to lead the Mavericks to a 108-104 victory over the Trail Blazers in Portland. Wesley Matthews added a season-high 27 points for the Mavericks, who are now two games behind the Nuggets for the eighth and final playoff spot in the West.